This entry was posted on March 30, 2014 at 11:00 pm and is filed under Action, Adventure, Drama with tags 2014. You can follow any responses to this entry through the RSS 2.0 feed. You can leave a response, or trackback from your own site. I’m not an Aronofsky fan and this movie doesn’t change that. I won’t go over all of my review but I shared a slightly different take. I never got the sense he was trying to please both sides. I felt this was so far removed from the biblical text and it was actually a secular activist film. And there are so many flaws just in the storytelling and conception itself. I had tons of issues with it. 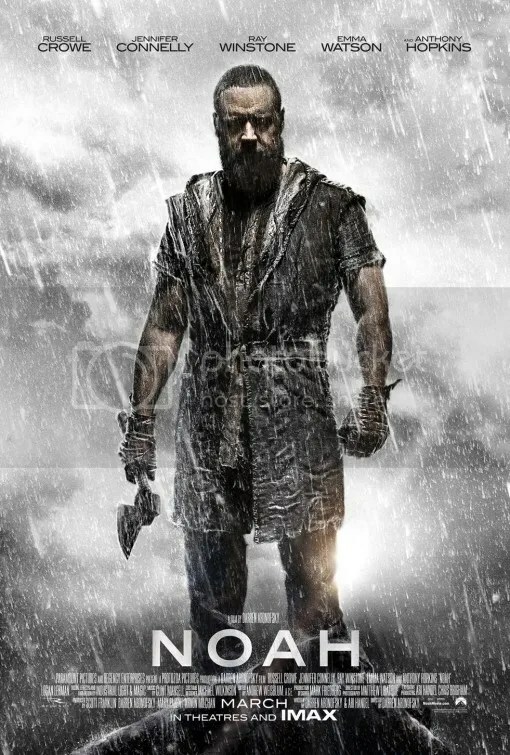 The biblical passages about Noah are so brief, you’d almost have to deviate from the text to make a movie. Perhaps it should’ve been a short. The problem is in how he chose to deviate wasn’t interesting. On another note, Noah is so saintly, so unwavering in his devotion to God’s plan he doesn’t even seem human. That’s where I feel like Darren could’ve demonstrated how a human being would react to this task. This would’ve made Noah’s journey more personal and emotionally involving. I agree with you that from a storytelling standpoint this was half-baked. I didn’t love it. I didn’t hate it. It was just meh. Good write up. I think I will pass, even though I should probably review it! But the middling reviews really seem to paint this as a average boring film, which can be worse than a bad film. The ol’ tomatometer is at 76% which would suggest acclaim. However when I survey general audiences and other bloggers I get a much more negative reaction. I could have sworn that Aronofsky was Jewish (hence the whole assembly of Pi), but I guess I was wrong, or he lost entire faith at some point. Anyway, two and a half stars seems really generous if you’re saying that Noah, ultimately, doesn’t please anybody. I guess the visuals were *really*good, lol! I’m not sure any review can convince me away from this though. Huge Darren Aronofsky fan. Every one of his films strikes me as sub par initially, but then they just grow on me more and more. Particularly, Requiem for a Dream. I gave that one a B+ (three stars out of four), but I’m feeling like if I rewatched it, it’d be a strong A+ (four stars out of four, of course). The Fountain, I just haven’t gotten around to because it received mixed reception, and Black Swan I’m trying to find a method to sneak a viewing in because my parents don’t want me watching it. I was going to go see Noah last weekend–with my disturbingly religious grandmother, who loved Son of God, in fact–but things didn’t go according to plans…I hate being so busy!! Darren Aronofsky was raised Jewish, but he identifies as an atheist now. The movie is perfectly middle-of-the-road so 2 ½ stars is the ideal rating. It’s not bad, not good. I’m certainly not trying to convince people to avoid it, but I think I’ve encapsulated the movie’s positives and negatives to give viewers the info they need to decide whether they will enjoy this. Yeah I’m not sure I’ll enjoy it myself but I’ll see it this weekend. He was obviously trying to appeal to both fans of Michael Bay as well as fans of the Bible. I agree it got a bit silly. Nice review. We share similar thoughts. I thought Noah was kind of a mess, but an interesting mess. Still, Aronofsky’s the wrong director for this kind of material and he works better in smaller-scale projects. Amen. I appreciate his smaller scale, more introspective films. Black Swan proved he was capable of a box office hit without having to spend a ton of money. Yeah Noah wasn’t sweet but honestly God’s dissatisfaction with the human race wasn’t sweet either. Sweet old man he was not, with the drunkenness episode and the bewildering, vengeful, over the top, and vindictive Curse of Ham in the Biblical account. I’m sure Aronofsky made an effort to delve into the Rabbinical tradition’s discussion of Noah as “righteous” only in the context of his immoral generation but not “righteous” per se. I’m amused by people who think of Noah as some sweet old grandfatherly type fellow. Old Testament is some serious stuff. I mean God told Abraham to kill his son just because.